The Levee Has Broken: Led Zeppelin Now On iTunes! It’s been a long time since I rock and rolled…..but the wait is over. Led Zeppelin are now available in iTunes – the complete mamajama collection, remastered. 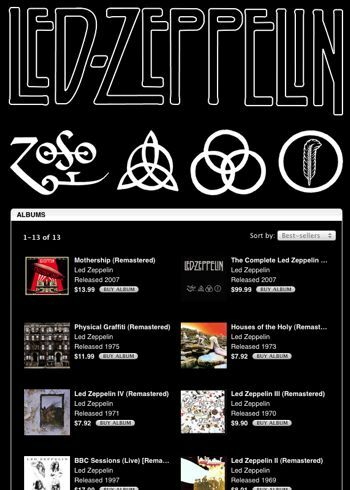 Each of Zep’s individual albums is available, or you can get everything for $99. We’re going to get the tracks off the one CD out of the Zeppelin boxed set that got ripped off from our car. Sorry Zune fans – looks like you’re screwed again. Maybe in a few years Microsoft will get Zeppelin! Tolkein references in Zeppelin songs. Hey allenwretch…. i have Zune, its november 13 2007, and i just downloaded some Zeppelin….. so much for you apple fanboys talkin crap before you even do research, sounds typical of a mac user. Noted – it sound like you are officially ready to rock and roll!